Viewing Mt. Monadnock from all angles. Thank you for sending me an image of your painting by American artist William Preston Phelps (1848-1923). It is a fine painting by a Dublin Art Colony artist who was considered to be "the painter of Mount Monadnock." Phelps was born on a farm in Chesham (Dublin), NH, and was brought up learning the agricultural skills necessary to be a farmer in the 19th century. He always had a passion for drawing and even practiced in grade school on the pages of his text books. Unhappy with the farming life, he left as a teenager to take up sign-making in Lowell, Mass., and pursue his dream to be an artist. Send a photo to bcoles@nhmagazine.com. If there are markings, please take a clear photo of them as well. If your submission is selected, we'll have expert Jason Hackler appraise it. Hackler, manager/owner of New Hampshire Antique Co-op in Milford (nhantiquecoop.com) and partner of Jason Samuel Antiques, is a past officer of the Granite State Antique and Appraisers Association, a principal of the Active Appraisal Group and a member of the N.H. Antique Dealers Association. After years of painting on his own, Phelps was encouraged to seek out formal study. In 1875 he left for Munich, Germany, and the next several years were spent working in Italy, France and Scotland. Upon his return to the United States he opened a studio in Lowell and continued to paint with much success. His work became well-respected in Boston galleries and exhibitions, as well as the National Academy of Design in New York. Despite his successes Phelps felt as if his work was missing an intangible vital element. On a trip to Dublin to visit his old homestead, he realized that what he lacked and missed was his hometown's majestic icon: Mount Monadnock. Phelps began to understand that the mountain was what his life's work was about. 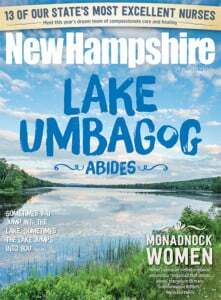 Monadnock's spectacle and the grandeur of nature gave him a newfound inspiration. His boyhood memory came alive again and he returned to live in his childhood home. Phelps built a secluded studio complete with a large window to let in light and a huge fieldstone fireplace for warmth. He began to study and paint Mount Monadnock from all angles. The mountain possessed the beauty and wonder he strived for in his work, the challenges he craved and an ever-changing environment. To further explore his love for plein air painting (painting outdoors in the open air), Phelps created a mobile studio with a portable heater, thus protecting him from inclement weather and allowing him to paint outdoors during the harsh winter months in New England. Phelps' passion for Mount Monadnock and its natural surroundings is the power behind his work. Sadly, after a series of misfortunes, many of his paintings, as well as his home, were sold in 1917 at auction. One of his works that he was most proud of – a large-scale painting of the Grand Canyon that he kept behind a velvet curtain – was included in the sale. Its whereabouts are still unknown. Currently, Phelps fans can enjoy viewing a superlative painting of Mount Monadnock at the Currier Museum of Art. Another grand-scale Phelps painting can be seen at our gallery in Milford, depicting Phelps' knowledge of farm life in an iconic Americana scene of carving pumpkins in a field. Your Phelps winter scene of Mount Monadnock is a great work and I would appraise it at $14,000.